DesmoTexas is here to unite Ducatisti throughout Texas, sharing our passion for Ducatis and our enjoyment of motorcycling. Membership is open to anyone riding or interested in Ducatis or other European motorcycles. We maintain an online forum enabling members to meet other Ducati owners, find riding partners, set up group rides & trips, and share knowledge & skills. 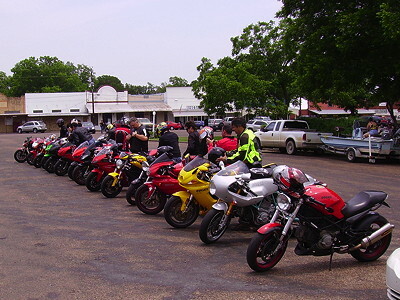 DesmoTexas also provides an online presence opportunity for local Ducati clubs throughout Texas. It's really easy to join DesmoTexas: Just register on the DesmoTexas Forums! Doing so will give you full access to the Forums and to the DesmoTexas Gallery. When you register please take a few moments to fill out your profile, then the extended profile. That will help other DesmoTexas members with similar interests find you. Residents of the greater Houston area also should consider joining SETexDOC, the Southeast Texas Ducati Owners Club. SETexDOC organizes frequent rides and local events. Most are open to all riders and all bikes. Joining SETexDOC will give you additional access to the SETexDOC sections of the DesmoTexas Forums and Galleries. And best of all, it's free!